Unleashed Bible Study Book includes small-group experiences for six sessions, individual study opportunities for five days each week, applicable Scripture, "How to Use This Study," and tips for leading a group. God's will is not just for us to be born again but for us to grow into spiritual adults. God intends all of the Christian life to be a process of growth in Christlikeness. First Thessalonians 4:3 says, "This is the will of God, your sanctification." Paul also instructs, "Those whom he foreknew he also predestined to be conformed to the image of his Son, in order that he might be the firstborn among many brothers." In light of these rich realities, believers must clearly understand how we can intentionally cooperate with the Holy Spirit's work to grow us into the likeness of Jesus. Sanctification is victorious struggle-victorious in that Jesus has secured our sanctification but a struggle in that we are called to actively pursue holiness. Unleashed is a biblically based, practical tool that unleashes believers for spiritual growth in Jesus Christ. Taking into account ways God uses different stages and seasons in our lives to shape us, this study helps participants understand the lifelong process of spiritual growth and maximize God's work to conform them to the image of Christ. 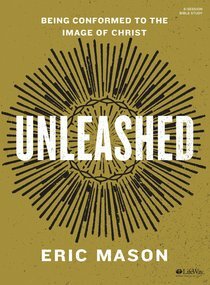 About "Unleashed (Bible Study Book)"
Eric Masonis cofounder and lead pastor of Epiphany Fellowship in Philadelphia, Pennsylvania. He holds degrees from Dallas Theological Seminary (ThM) and Gordon-Conwell Theological Seminary (DMin). Eric and his wife have two children.